One of the most valuable tools acquired in a university education, college algebra is essential for courses from the sciences to computing, engineering to mathematics. It can help you do better on placement exams, even before college, and it's useful in solving the computations of daily life. Now anyone with an interest in college algebra can master it. 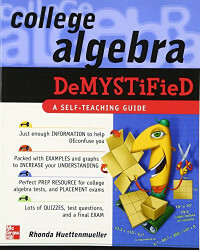 In College Algebra Demystified, entertaining author and experienced teacher Rhonda Huettenmueller breaks college algebra down into manageable bites with practical examples, real data, and a new approach that banishes algebra's mystery. With College Algebra Demystified, you master the subject one simple step at a time—at your own speed. Unlike most books on college algebra, general concepts are presented first—and the details follow. In order to make the process as clear and simple as possible, long computations are presented in a logical, layered progression with just one execution per step.